SAN FRANCISCO, Calif., March 3, 2014 (SEND2PRESS NEWSWIRE) -- EPIC (Edgewood Partners Insurance Center), a retail property, casualty insurance brokerage and employee benefits consultant, has added Cheryl Doege as a senior consultant to their national employee benefits consulting practice. Doege brings 23 years of experience in human resources and benefits consulting to EPIC with specialties in benefit program design and funding strategies. 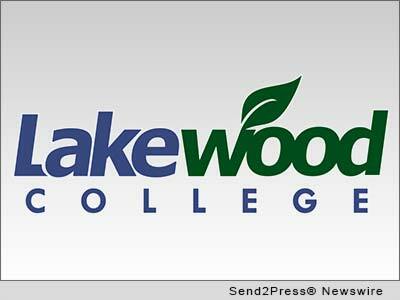 CLEVELAND, Ohio, March 3, 2014 (SEND2PRESS NEWSWIRE) -- Military Advanced Education (MAE) has awarded Lakewood College the designation of a Top Military-Friendly College in its 2014 Guide to Military-Friendly Colleges and Universities, just released in print, and available online. MIDLAND, Mich., March 3, 2014 (SEND2PRESS NEWSWIRE) -- HVS Capital Corp has been exclusively appointed to sell the 235-room Midland Resort and Convention Center in Midland, Michigan. This full-service hotel possesses nearly double the meeting space of any other property in the market, along with a sizable indoor recreation area that includes a lap pool, a whirlpool, a fitness room, a children's play area and a game room. LOS ANGELES, Calif., Feb. 28, 2014 (SEND2PRESS NEWSWIRE) -- Every one of us has been through the emotional roller coaster leading up to a first kiss and all of those sensations are presented in 'Good Night Kiss,' the latest country song from Shady Hill Records artist Sandra Piller. MONROVIA, Calif., Feb. 27, 2014 (SEND2PRESS NEWSWIRE) -- Five young women from Monrovia High School and their rhinestone-encrusted robot won the top Inspire Award at the Los Angeles FTC (FIRST Tech Challenge) Regional Championship Tournament held at Monrovia this past Saturday, the Monrovia High School Robotics Program announced today. Along with six other teams from cities ranging from Santa Barbara to San Diego, they advance to compete with top teams from eleven western states, Alaska and Hawaii in McClellan, Calif., near Sacramento on March 20-22, 2014 at the West Super-Regional FTC Championship. DULUTH, Ga., Feb. 27, 2014 (SEND2PRESS NEWSWIRE) -- EPIC, a retail property, casualty insurance brokerage and employee benefits consultant, announced today that it has added Sean Leonard to the employee benefits consulting practice in their Southeast division, The McCart Group. Leonard brings more than 19 years of managerial experience in human resource and benefits, including 12 years spent in benefits consulting, insurance sales and client relationship management. OKLAHOMA CITY, Okla., Feb. 27, 2014 (SEND2PRESS NEWSWIRE) -- The number of Americans seeking help for dental-related pain at hospital emergency rooms is at a record high, says Delta Dental of Oklahoma. Dental ER visits increased from 1.1 million in 2000 to 2.1 million in 2010 and cost the healthcare system more than $2 billion annually. SAN DIEGO, Calif., Feb. 26, 2014 (SEND2PRESS NEWSWIRE) -- ReverseVision, the leading software and technology provider for the reverse mortgage industry, has added Jason Meches as Chief Technology Officer (CTO). In this role, Meches will have responsibility for the development and operations of ReverseVision technology products. DENVER, Colo., Feb. 26, 2014 (SEND2PRESS NEWSWIRE) -- Titan Capital Solutions (TCS), a wholly-owned correspondent lending subsidiary of mortgage outsource services provider Titan Lenders Corp., announced it has achieved significant growth in 2013, signing on 65 clients in its first full year of operations. SALT LAKE CITY, Utah, Feb. 26, 2014 (SEND2PRESS NEWSWIRE) -- Mortgage document preparation vendor International Document Services, Inc. (IDS) announced its flagship doc prep system idsDoc is fully capable of supporting electronic signatures for Federal Housing Administration (FHA) documents. The FHA announced on Jan. 30 that it would accept e-signatures on documents associated with FHA-insured loans. 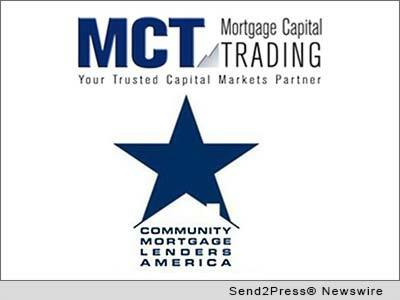 SAN DIEGO, Calif., Feb. 25, 2014 (SEND2PRESS NEWSWIRE) -- MCT Trading, Inc. (MCT), a recognized leader in mortgage pipeline hedging and risk management services, announced that its COO, Phil Rasori, will share his insight on an upcoming panel assembled by the Community Mortgage Lenders of America (CMLA), which is designed to address legislative issues and trending that will impact mortgage lending in 2014. TROY, Mich., Feb. 25, 2014 (SEND2PRESS NEWSWIRE) -- Right now, loan officers at Shore Mortgage - one of a select group of home lenders operating in all 50 states - are counseling clients on a new mortgage option that allows home owners to customize both the length of the loan and the payment like never before imagined. RED BANK, N.J., Feb. 25, 2014 (SEND2PRESS NEWSWIRE) -- Spring Forward in Joy and Light Event with over 50 Vendors, Holistic Natural Energy Healers and Readers, will be open from 10 a.m. to 5 p.m. on Sunday, March 9, 2014, at the Red Bank Elks Lodge 40 W Front St, Red Bank, NJ 07701. Entrance fee $25 includes 4 free 15 minute healing/spiritual modalities, Shamanic Ceremonies, Drumming, Singing Bowls, Door Prizes, 50/50 Prize, Silent Auction and much, much more. SAN FRANCISCO, Calif., Feb. 25, 2014 (SEND2PRESS NEWSWIRE) -- One Virtual Source (OVS), in collaboration with the Philippine Trade and Investment Center-Silicon Valley (PTIC-SV) presented to a crowd of entrepreneurs, startups and technology managers, discussing best practices in leveraging international software companies as a way to reduce costs and drive business growth. LANSDALE, Pa., Feb. 25, 2014 (SEND2PRESS NEWSWIRE) -- Global DMS, the leading provider of Web-based compliant valuation management software, announced that Forsythe Appraisals, LLC, the largest independent provider of residential real estate appraisals in the United States, is leveraging the eTrac Enterprise platform to manage appraisal ordering, tracking and review for all of its branch offices covering 40 major metropolitan areas across the country. LOS ANGELES, Calif., Feb. 25, 2014 (SEND2PRESS NEWSWIRE) -- Galorath, Inc. is excited to announce that it has reached an agreement with Dassault Systemes, to integrate SEER for Manufacturing with CATIA, the world's leading application for product design and innovation. For many companies, cost estimating is a very fragmented activity and the inclusion of SEER's Cost Estimator in CATIA will allow manufacturers to initially model and test composite manufacturing processes and tradeoffs during the earliest and most preliminary stages of design. 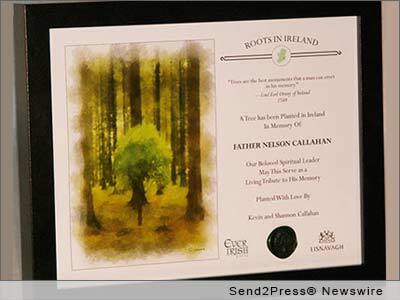 CLEVELAND, Ohio, Feb. 24, 2014 (SEND2PRESS NEWSWIRE) -- Ever Irish Gifts, an e-commerce site, today announced a distinctive way to celebrate a loved one's birthday, anniversary or marriage or to memorialize someone's life - plant a tree in Ireland in their honor or memory. SAN MATEO, Calif., Feb. 24, 2014 (SEND2PRESS NEWSWIRE) -- EPIC (Edgewood Partners Insurance Center), a nationally expanding retail property, casualty and employee benefits insurance brokerage, announced today that Jim Gillette has been named as a 2014 Risk and Insurance Retail Industry Power Broker. In addition to Gillette, Kathleen Felderman, managing principal and the leader of EPIC's national real estate practice, was also recognized as a 2014 Real Estate Industry Power Broker Finalist.